The UrBin Grower provides endless organic vegetables by facilitating growth through a mixture of the Square Foot Gardening method, all natural soil amendments, and a self-watering reservoir. Simply mix in the amendments with your soil, plant your vegetables, and wait until the roots are long enough to dip into the water reservoir. You'll never have to worry about over or under watering again! A small footprint makes the UrBin Grower a perfect addition for the corner of your balcony, and with its unique external reservoir you won't have to remember to fit watering into your busy schedule. By using the Worm Factory 360 as a companion product, you can fit a square foot garden complete with compost pile on your balcony! There is no reason for you to feel left out of growing your own delicious organic vegetables simply because you lack a backyard. The UrBin Grower is a self-watering container, which means you don't need to rush in the morning to water your windowboxes or patio garden, or risk coming home to droopy, wilting plants. 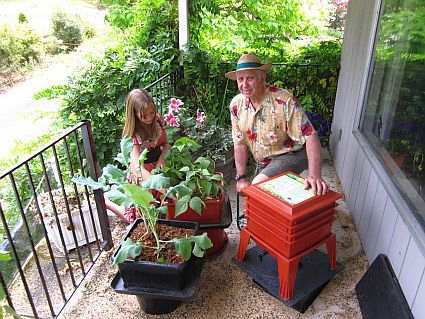 The UrBin Grower uses a square water reservoir which the container rests in. 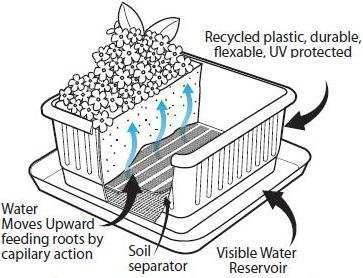 The roots of the plant you have in the container will be able to reach down through the soil and drink from the resevoir when necessary, which prevents under or over watering. *Provides 30 trace minerals to promote strong, leafy growth! 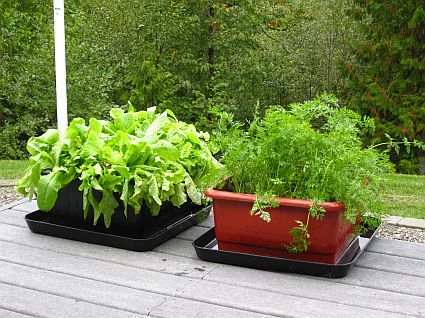 *All the benefits without the headache of having to plot your garden! *Made using high quality recycled plastics! *Use your compost to produce healthy, all natural veggies! Save $$ when you buy the UrBin Grower 2 Unit Kit! Everything you see here is included in the UrBin Grower package. Each UrBin Grower Twin Unit System comes complete with two containers, two watering trays, two soil separators, the instructional manual and accompanying DVD, and all of the coir and trace mineral soil amendments. Combine the UrBin Grower with the Worm Factory® 360 Composting System! Recycle your kitchen and household waste (which is usally discarded) into 100% organic vermicompost. Sustainable, Ongoing, Easy to Manage!